You’ve got a great-looking website, but is anyone visiting it? Would you benefit if your business was listed higher up in search engine results? That’s where we can help. By investing in good quality Search Engine Optimisation (SEO), your website will perform better and you’ll attract more customers. Any smart business owner knows it’s important to invest in marketing to attract more sales. Search Engine Optimisation (SEO) is the practice of improving and promoting a website so that it receives more visitors from search engines. There are many different aspects to SEO, from what words are displayed on your pages; to how well your website programming is written; to the way that other websites link to yours. It’s all about ensuring your business website is displayed in a way that search engines understand and we help them recognise the authority and relevance of your business. But to do SEO properly, as you’ll see below, it does involve a lot of know-how. Why we're different to other SEO providers? Don’t be fooled by SEO companies who make false promises (and lots do!). It’s also widely known that some SEO techniques, quite often employed by budget firms, can end up getting your website banned from Google in the long-term. We’ll give you a realistic assessment of how SEO could help your business and, if we don’t think you’ll benefit from our SEO services, we’ll simply not take your money in the first place. We’re passionate about delivering quality and give each and every customer a personal level of service. So many SEO companies tie you into an expensive monthly fee. It’s a lucrative money-maker for them! We don’t agree things should work that way. Unbelievably, we’ve even seen SEO work removed from a customer’s websites after they cancelled their contract with another SEO firm. It’s no wonder the customer moved their websites to Primary Image! We only charge for the work we actually do. It means you have the option to spend as little or as much as you like, but knowing that everything we do is itemised and explained to you. Our unique price plan below means we tailor our work only to what your website needs. Virtually all other SEO companies try to cover every type of website software. But you wouldn’t let a bicycle mechanic lose on a truck! So why not pick a specialist who knows exactly how your website works and has the right tools for the job? 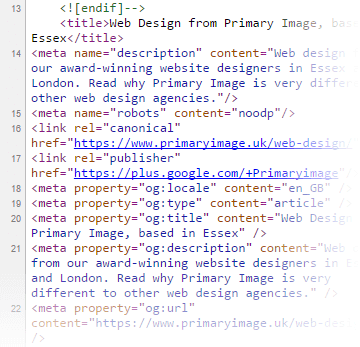 Primary Image only does SEO on WordPress websites. We’re experts in using WordPress (see our web design experience) and we’ve been launching successful websites for over fifteen years. 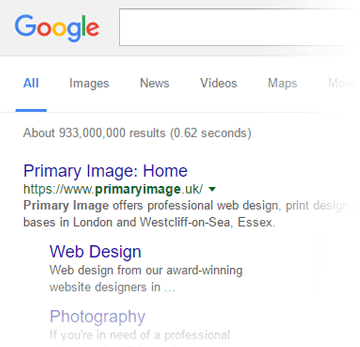 If you want your SEO done well, choose a reputable company like Primary Image. Because a one-size-fits-all approach doesn't work! You must carefully choose the best phrase to target in Google, otherwise you’re wasting time and money. We’ll do research to find phrases that are worth targeting, taking into account the number of monthly searches (in your chosen geographic area) and how much competition there is for the different phrases (i.e. ones you can realistically rank highly for). We’ll typically examine about 50 phrases, but will recommend two or three in our report. We’ll install and setup leading SEO software on your website. This helps present your website better in search engine results and on social media networks. It also generates a sitemap file (an index of all your website’s pages that search engines can read) and more technical functions. In addition, it displays an intuitive traffic light system in your website editor, which guides you through writing each page. Having a Google business listing means your logo and other details may display in Google’s results, as well as on Google Maps. We’ll set this up and add the relevant info. We’ll take your website through the verification process with Google, which will tell us how they’re currently seeing your website. You’ll gain access to extra analytics, plus Google will email you if it spots any problems with your site. We’ll also ensure Google know some key details about your website and we’ll submit a sitemap file. Similar to above, we can also take you through the verification and setup process with Bing. The Bing search engine is owned by Microsoft and is the default search engine on many computers. We’ll improve the SEO of an existing page on your website. This includes carefully positioning your keywords in the right places, so search engines give maximum attention to your keywords, as well as putting in the correct technical coding tags throughout your pages. We will also influence how your website displays in the search engine’s results listings, by writing title and description tags, and making it more appealing for people to click on. One key phrase (decided by you), per page. We’ll craft a full page of compelling, SEO rich content, which will be published on your website to attract search engines. We will research the topic, write at least 300 words (the minimum for good SEO), and check this with you, before publishing the page on your website. Did you know that your position in search engine results can change every few days? Changes to your website’s content, improvements to your competitors’ websites, or even Google’s own algorithms, mean that results are continually changing. It’s important to keep track of what’s happening with your SEO so you know what’s working and what’s not. We’ll monitor your SEO rankings every week, giving you access to our web-based panel, as well as weekly emailed reports. Getting out-ranked by a competitor? We’ll find out what SEO techniques they’re using and prepare a report on what can be improved on your own website. We’ll setup a visitor stats panel, so you can keep track of how many visitors are coming to your website each day; how they’re finding you; where they’re located; and much more… We’ll also send you a weekly and monthly summary email too. See our visitor analytics page for more details. If you already have our WordPress web hosting, then you’ll receive this visitor stats service for free, along with many other benefits! This is one of the most important parts of our SEO work. Search engines use various signals to rank websites. As well as the content on your own site, search engines want to see mentions or endorsements of your website on other external sites (called “backlinks”). The strongest backlinks that can really boost your website’s SEO are by those websites with the strongest reputation (e.g. news outlets, trade associations, etc). Search engines have very advanced algorithms that decide how weightings pass from one website to another. Don’t worry if SEO causes you a big headache! We’ll always talk to you in plain English! We can’t deny it, we’re massive geeks when it comes to the technical stuff, but we know what works.